BETTER THAN HALF PRICE SPRING SALE (50% + an extra 10% off) offer relates to kitchen cabinets only. Offer valid for kitchens purchased before 31 May 2019. Teka Wish Range HLB830 Single Fan Oven with HydroClean PRO function, A+ rated, Touch Control panel with LED display, 5 year warranty. Teka EX60.14G 60cm Gas Hob, Stainless Steel, 5 year warranty. Teka DSJ650 60cm Chimney Hood, Stainless Steel, 5 year warranty. Prima PRDW200 Integrated Dishwasher, 2 year warranty. We reserve the right to change or send different appliance models if there is stock shortage. 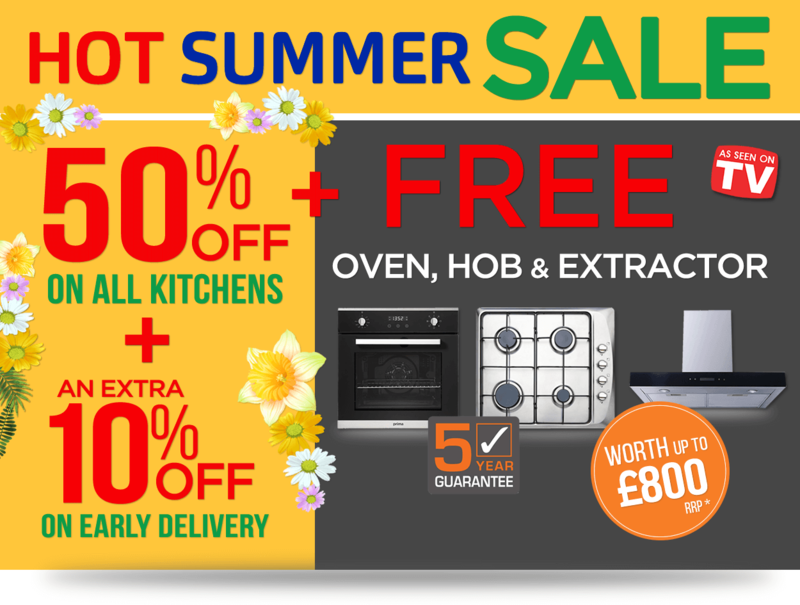 FREE oven, hob, extractor and dishwasher offer valid to orders placed before 31 May 2019. Minimum furniture order value £3,800. Minimum order value shown above is after Spring Sale offer discount of 50% and an extra 10% (if applicable) has been applied on cabinets. Offers are only valid for orders sold from 22 April 2019 and cannot be replaced by an equivalent cash discount. Offers are only valid at point of order and not retrospectively. Offers may be extended or withdrawn at any time without prior notice.